India is one of the fastest growing economies in the world and has emerged as a key destination for foreign investors in recent years. Economic reforms initiated in 1991 have grown in scope and scale and yielded increasingly salutary dividends. One of them is the steady improvement in India’s relative position in the global economy, reflected in New Delhi’s growing influence in international institutions (G-8, G-20) and negotiating free trade areas (with ASEAN, EU). Another is the improved efficiency in the economy and adoption of international “best practices” in the production of a range of goods and services. A third outcome is India ranking amongst the top ten investment destinations since 2007-08, attracting US$ 195 bn in FDI and US$ 97 bn in FII over the past 5 years. India’s GDP has also grown at around 7.9 per cent between 2003 and 2012. This trend, according to the International Monetary Fund (IMF)1, is likely to continue for the next five years with an average GDP growth rate of 7.7 per cent per annum till 2017. India’s GDP for 2013, valued at US$ 1.9 trillion at current prices is the 10th largest in the world. The government has set a target of 8 per cent during the current Five Year Plan (2012-2017), based on the demonstrated ability to sustain national economic growth despite the global financial crisis, Euro zone woes a nd the resultant slack external demand in recent years. India not only supports one of the largest populations in the world, but also one of the youngest. Fifty per cent of its population is below the age of 25 and two-thirds below the age of 35. Also, about 65 per cent of Indians are in the working age group of 15 to 64 years, giving the country a significant edge in terms of cost competitiveness and low labour costs. Moreover, India’s labour force has a strong knowledge base with a significant English-speaking population, making it a top destination for multinational corporations that are looking to expand their overseas operations for market and talent. "Two hundred and fifty million people are set to join India's workforce by 2030. As a big chunk of the population shifts into the working age group, the offshoot of that is an increase in disposable income and conspicuous consumption. This is the most exciting aspect of India's demographic dividend." Consumer spending in India grew from US$ 549 billion to US$ 1.06 trillion between 2006 and 2011, putting India on the path to becoming one of the world’s largest consumer markets by 2025. India’s consumption is expected to rise 7.3 per cent annually over the next 20 years. By 2040, nine out of every ten Indians will belong to ‘the global middle class group’ with daily expenditures ranging between US$ 10 and US$ 100 per person in today’s purchasing power parity terms. Seventy percent of this expenditure will be on discretionary items like entertainment, healthcare, communication, education, personal products, services and so on. The absolute number of India’s middle class will touch 1 billion by 2039, with its influence on global middle class consumption captured in the figure below. This rise of India’s “new middle class” is globally significant as it will usher fundamental changes in India and around the world by triggering waves of innovation in the production, distribution and delivery of goods and services, including government services. Innovations - like the US$ 2200 Nano car by Tata Motors, the inexpensive hand-held electrocardiogram (ECG) machine from GE Healthcare, a low-cost water purifier called ‘Tata Swach’ by Tata Chemicals, a battery-powered ‘ChotuKool’ refrigerator by Godrej, and a mobile phone application called ‘Nokia Life Tools’ by Nokia for rural consumers to access agricultural, educational and entertainment content - are some examples of frugal engineering that are primarily aimed at the Indian market, but will likely find buyers in many other parts of the world as well. 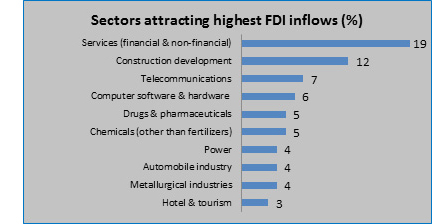 Trends in India’s Foreign Direct Investment (FDI) are an endorsement of its status as a preferred investment destination amongst global investors. India's strengths span telecommunications, information technology, auto components, chemicals, apparels, pharmaceuticals, and jewellery. India’s steady economic liberalization and its embrace of the global economy have been key factors in attracting FDI. The government recently opened up multi-brand retail and civil aviation markets to 51 and 49 per cent FDI respectively and with more reforms expected in insurance and pension sectors, among others, India will continue to offer compelling opportunities to the global investment community. *Chess was invented in India. Algebra, trigonometry and calculus too. *33.5%house-holds draw drinking water from a hand pump. *It has the second-largest labour force. Is self sufficient in grain and cloth, makes more than a million cars a year, and has launched 65 satellites.